Everyone seems to have an opinion on textiles. Either you love them or you don’t (or maybe you are somewhere in-between). I have come to like textiles more over the past year as I interned with The George Washington University Museum and the Textile Museum in the spring- I helped them with social media, as well as with other communication and education initiatives- and Cooper Hewitt, where I interned this summer, has a very strong textile collection, as well. Their latest exhibition, “Bingata! Only in Okinawa” looks at the Bingata dying technique. For those of you not familiar with Okinawa, it is part of Japan, but has a very separate and unique identity. The exhibition looks at the southern most prefecture of Japan, Okinawa, and the culture of the Ryukyu Kingdom. Bingata, a dyeing technique, is at the center of the exhibition. 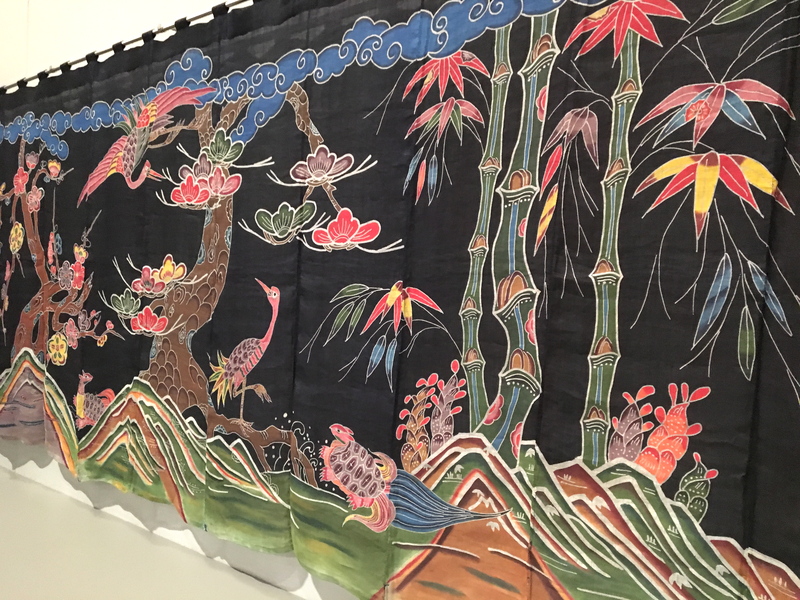 In Bingata, rice paste is used to stop certain pigments from adding color to certain parts of the fabric. Rice past is applied over a stencil and placed on different areas of the fabric in order to cover the entire piece. The paste keeps certain areas of the fabric from becoming dyed, while areas without paste are dyed a variety of colors. Here is a video that illustrates the process a bit further (it is not in English, but it will give you a strong visual sense). One of my favorite pieces in the show- a wedding dress by Kanna Yamauti- powdered coral was used in the weaving process for the lace. One of the most interesting parts of the show was the different types of Bingata techniques. For example, the Tsutsugaki is a technique in which the pattern goes directly onto the cloth, whereas there is also the stencil resist dying. Additionally, there are many differences between classical Japanese kimonos and Ryukyuan kimonos. I had no idea how distinct a culture came from this region. The piece below shows the stencil dying process. The intricacy is pretty amazing to consider here, and I love all of the shapes and colors. I liked how the exhibition focused on one main technique as a theme as opposed to trying to cover bits and pieces from multiple techniques. Panels showing stencil dyeing process- from Reiko Fujimura. Shigu (blade used for stencil cutting), Rukujyu (dried tofu acts as a pad when cutting stencils) and impressing brushes made out of hair. Hey Hanna- great post!! I love the detail you provided within your writing. I am not very familiar with textiles myself, but this post was very informative. The pictures were very unique and added a lot to the post. I also really enjoyed the Youtube clip- I think you chose a great spot to start on. You were right, the language did not make a difference. The visual appeal was fantastic!